Oh Janey....this is perfect. I love it. Gone straight on my favs. Aww its gorgeous Janey..The blue and white go's Great Together..
Really pretty. This looks the ideal spot for afternoon tea on the lawn. Gorgeous. I want to live in a cottage! Oh Janey this is just beautiful, cottage gardens are my favourites. that picture is in my dreams beautiful! Afternoon tea....Pasuki......yes, you are all welcome.....made chocolate brownies yesterday...so come on over!!..... :o) Such a lot of lovely comments! So lovely. I'm enjoying looking through the Cottage Garden Section, it's brightening up January. I should be made the most of one of the first decent days, I know. However I have to admit I went to the Turner Exhibition instead - will try harder tomorrow! Yes it was great. Turner and the Masters it was called and I had been meaning to go since it opened, quite some time ago. Finishes on 31st Jan so had to get there - not at all difficult for me since it's only a tube ride away. Then I spent another 2 hours looking round the rest of Tate Britain and was exhausted when I got home. Back to the garden tomorrow for sure. 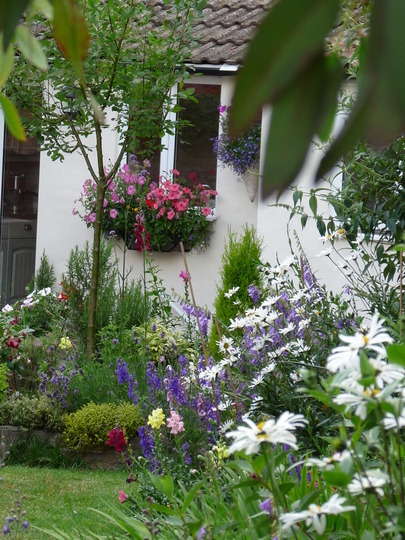 Look forward to more of your garden photographs soon Janey. Yes, most were wonderful, especially a view of the River Thames from the hill, which I see most days. I agree about Van Gough, not an artist whoes work I would get too excited about seeing. Aw thanks Ba, are you still lost in Somerset...Lol!! A bit late, but I've just been looking through your photos Janey. What a romantic dreamy garden, absolutely gorgeous! Look forward to seeing what you'll be doing, with the planting scheme. I just love the white daisies in the front, my favorite, I adore daisies! One thing about the garden.. it couldn't be improved that's for sure, it's lovely already! They're Leucanthemums Helenium....been in the garden for a long time....I'll pm you.